A big part of the Hackaday Prize this year is robotics modules, and already we’ve seen a lot of projects adding intelligence to motors. Whether that’s current sensing, RPM feedback, PID control, or adding an encoder, motors are getting smart. Usually, though, we’re talking about fancy brushless motors or steppers. The humble DC brushed motor is again left out in the cold. This project is aiming to fix that. It’s a smart motor driver for dumb DC brushed motors. You know, the motors you can buy for pennies. The motors that are the cheapest way to add movement to any project. Those motors. The Smart Motor Driver for Robotics allows a DC brushed motor to be controlled by a host microcontroller over I2C, and sends back the speed and direction of the motor. PID is implemented, and the motor can maintain its own speed, independently of a lot of difficult control on the host system. The guts of this motor controller are made of a PIC 12F microcontroller, a H-bridge motor driver, a Hall-effect sensor, and a neat magnetic encoder disc. 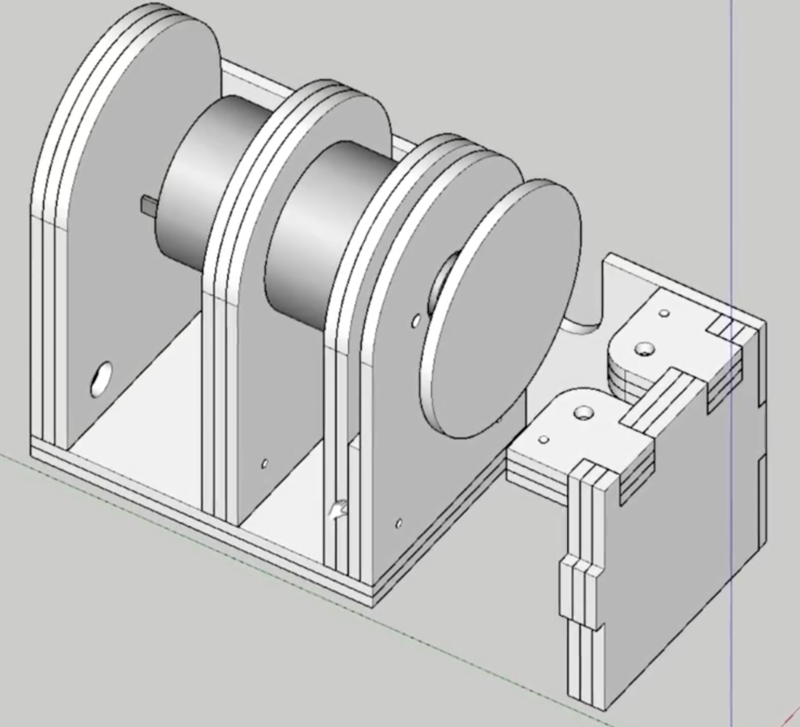 Ultimately, this project will simply bolt onto the back of a cheap brushed motor and give it the same capabilities as a fancy servo or stepper. It’s never going to have the same torque or power handling as a beefy NEMA 17 stepper, but sometimes you don’t need that, and a simple brushed motor will do. A great project, and an excellent entry for the Hackaday Prize. We’ve seen some cheap quadcopter builds over the years, but this one takes the cake. After seeing somebody post a joke about building a quadcopter frame out of zip ties and hot glue, [IronMew] decided to try it for real. The final result is a micro quadcopter that actually flies half-way decently and seems to be fairly resistant to crash damage thanks to the flexible structure. The first attempts at building the frame failed, as the zip ties (unsurprisingly) were too flexible and couldn’t support the weight of the motors. Eventually, [IronMew] realized that trying to replicate the traditional quadcopter frame design just wasn’t going to work. Rather than a body with arms radiating out to hold the motors, the layout he eventually came up with is essentially the reverse of a normal quadcopter frame. 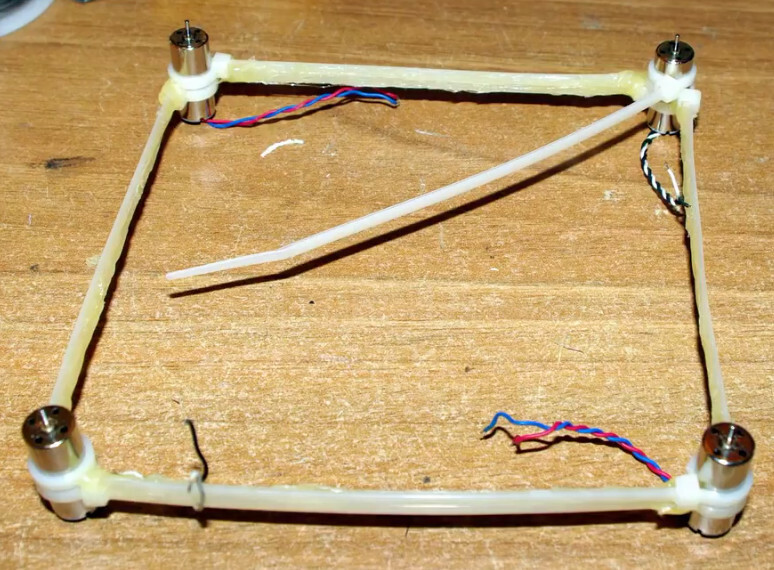 Zip ties reinforced with a healthy coating of hot glue are arranged into a square, with a motor at each corner. Then four zip ties are used to support the central “pod” which holds the battery and electronics. No attempt is made to strengthen this part of the frame, and as such the heavy central pod hangs down a bit in flight. [IronMew] theorizes that this might actually be beneficial in the end, as he believes it could have a stabilizing effect when it comes time to record FPV video. He mentions that he’s still struggling to get the PID values setup properly in the flight computer, but in the video after the break you can see that it’s flying fairly well for a first attempt. We wouldn’t recommend you tear into a bag of zip ties when it comes time to build your first quadcopter, but it does go to show that there’s plenty of room for experimentation. We’ve covered a number of unique quadcopter frames if you’re looking for something to set your next build apart from the rest. If you’ve got a big enough bed you can 3D print a very nice frame, but if you’ve got more time than equipment, you could always cut one out of a piece of plywood.